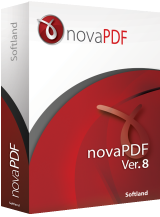 novaPDF Lite allows you to create PDF files from any printable document, including emails, Microsoft Office documents, web pages, texts. It works as a printer driver and you can print from any Windows application that supports printing – just set novaPDF Lite as the default printer and the document will be converted and saved as PDF file. Features include: customizable resolution, document information, predefined page size, quality settings and much more.